Happiness of the family >>>>>> World peace!? 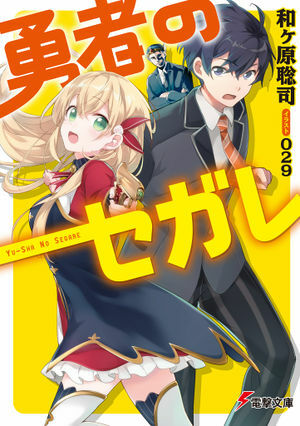 The curtain rises on another fantasy slice-of-life tale, brought to you by the “Hataraku Maou-sama!” team. On that day, an emergency family meeting was called to order at the residence of the Kenzaki family, an ordinary family living in Tokorozawa City. A blonde beauty named Dianaze Krone, Diana for short, had appeared from a different world, in the living room of the Kenzaki family . “I, an envoy, have come to summon the Hero of salvation, Kenzaki Hideo”. Wait, Hideo is my dad! To think such a game-like situation would fall upon me, Kenzaki Yasuo, an ordinary high school student. My father is a hero, and he saved a different world in his younger days!? There’s no way I can believe that this ordinary, middle-aged father of mine is a “Hero”, Diana looks at me, “The Son of the Hero” with a gaze filled with longing, my sister who saw that looks at me with a cold gaze… Before bringing back peace to the other world, the peace of our family is in big trouble! What is going to happen to my peaceful everyday life! ?